A pretty stork meets a handsome fox at a party and they dance all night. At the end, the fox invites the stork to his house, and to eat the soup he provides in a bowl, which the fox can eat easily but the stork cannot drink with her beak. 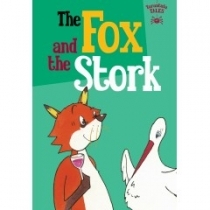 The stork returns the favour, and invites the fox to eat at her house, but the fox gets an unpleasant surprise when the stork treats the fox as he treated her. This moral tale has been around since the Middle Ages, and teaches the golden rule of conduct to do to others what one would wish for oneself.